In today's world, it would be difficult not to know something about interior design in all its iterations. After all, we have Pinterest, design magazines, and an entire home and garden television network that all bombard us with fun design ideas. Getting ideas that you think would be great in your home is no problem at all. But turning those ideas into a well-appointed room is a different thing altogether. Let us show you three examples of how we work and why having an interior designer makes life easier. The combined textures, the white walls, the aqua-colored glass bottle bedside lamp, all make this room cozy and inviting. The aqua knit throw and the velvety aqua throw pillow scream, "Take a nap!" Taking the ideas from this photo, learning exactly what you love about it and what you don't (for example, the matching furniture set is a little uninspired) and creating a bedroom you will love is a part of the magic. Yes, you can have a contemporary look without sacrificing a cozy ambiance. This living room is clean and fresh, but still invites you in for relaxed conversation or play time with the kids. We often hear statements from our clients such as, "We just don't know how you did this!" When you work with our team at La Finca, you will see that we can take the ideas you have about your decor and make them come to life. Just like those moments on Trading Spaces, when the homeowners entered their house for the first time after the gifted designer made their wishes come true, you will find our designers can use the choices you have presented concerning your interiors and make them into a reality. 3. Another reason interior designers are so helpful in turning your design dreams into reality is that they know "tricks of the trade" which many who have not studied in the field do not know. One example is "balancing" a setting. Something as simple as arranging throw pillows on a bed, or creating the right groupings of vases or candles, can make a real difference in the way a room comes across and how balanced it feels. There are even well-known "rules" that decorators use as short-hand when they are designing . . . though we think it's fun to break the rules from time to time, too. Let us help you clarify your ideas, offer you examples and opinions, sort them out for you, and give you that HGTV moment you've always wanted. Every time we make this happen for a family, we are just as excited and happy as the homeowners themselves. Textiles add dimension to your home with texture and pattern. Keep them smooth and solid. Pair shaggy with patterned. Choose between coordinated and contrasting. There are many ways to incorporate textiles into an interior to create a welcoming feel and add visual interest. A silky soft, furry throw on a bed will make it that much harder to get up in the morning! Fabric with a distinct pattern can instantly attract the eye and create a focal point in a room. Try selecting different patterns, but with a common color palette. Throw pillows on a couch are an easy way to practice. Go beyond textiles in order to add texture to your space. Wicker or rattan furniture can be the perfect accent that adds a subtle tactile effect to a room. Cane chairs have texture and pattern, but also lend a timeless feel. Don’t pass up the next one you spot at the thrift store! Have you played with pattern and texture in your home? Are you ready to refresh the look and feel of your space? Contact us and let us create that HGTV reveal moment for you. Kid-Friendly Design Can Be Chic, Too...We Promise!! Want those perfect, Pinterest-worthy room layouts without compromising the safety of your child or valuables? How surprised would you be if we told you it was totally doable? Very? And we have evidence to prove it! Let’s start with a look at one of our favorite projects- this lovely Ross Valley home- as an example of the perfect balance. 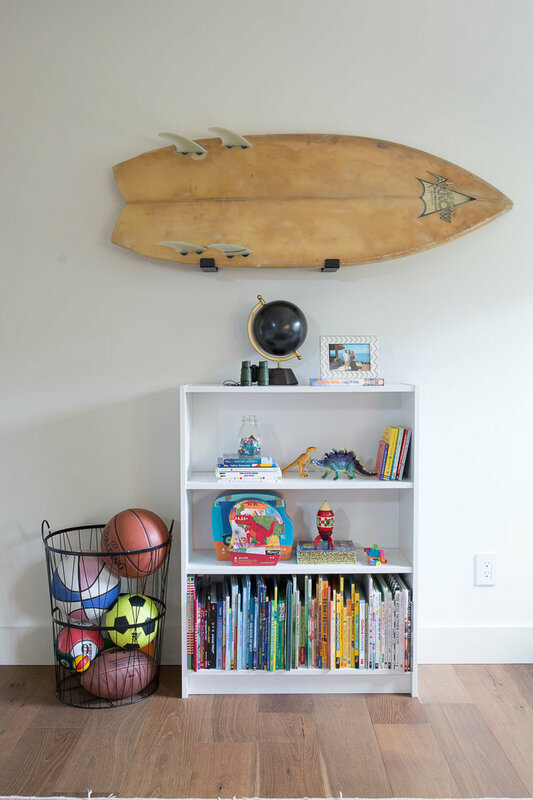 The kids station makes this room the perfect balance of chic and kid smart. Leaving things out and compromising on elegance generally comes to mind when kid-proofing but this time we decided to add something. The child-size station distracts your tot, but does not take away from the classy sophistication that characterizes the room—in fact we like to think it adds to it! Just to be sure though, most of the accent pieces in this room are thoughtfully arranged near the centers of the tables, high on the mantelpiece, or on a sideboard which incorporates both height and placement to make sure everyone (and everything) stays safe. The reachable items placed on the coffee table (plants, books, ashtray, etc.) are either in a basket with sides or are heavy enough to be fairly immovable—as well as large enough to not be a choking hazard. The soft pouf-style ottomans have two ingenious childproof features: they are too soft to create a bumping hazard and they are too squishy to be used as a step up to reach those décor pieces that are out of reach for a reason. Real life problems solved by chic solutions! Our Ash Avenue home showcases similar qualities. Another décor-matching playroom that includes your child! The white tables, neutral grays and browns carried throughout the house are mimicked in this playroom that we wish we had growing up! Even the little stools have similar large counterparts in the kitchen area of the house. That’s the kind of continuity and cohesive design we strive for without excluding anyone in the family. 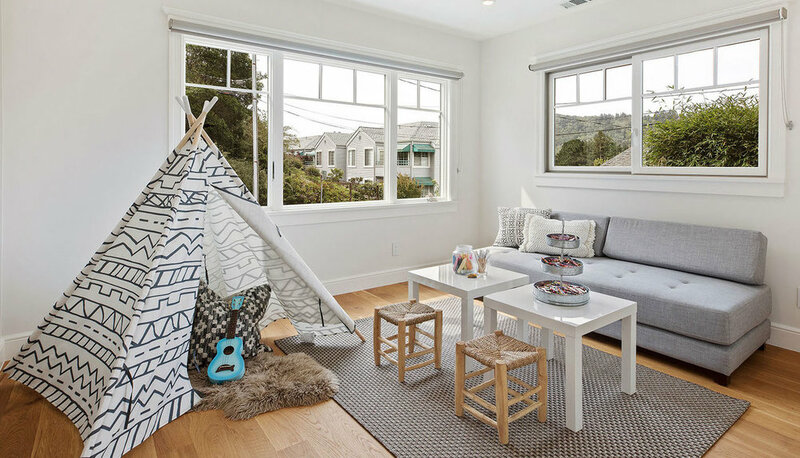 San Anselmo portrays perfectly how to add a pop of color while feeding your child’s creativity—all while allowing you to keep your house muy chic! The browns and whites of the playroom act as a canvas to bring out the deep blue chairs and pretty silver crayon holders. The bedrooms keep the airy feel characteristic of the house but the pillows and toys placed just so keep it homey, not to mention shatter-proof. Older kids have their own considerations to keep in mind. The Bretano Way house tackles those problems—most of which are organizational! The white shelves and nightstand keep that growing collection of books off the floor, while the wire basket keeps the sports equipment from under the bed. And who doesn’t need a little desk to make sure that schoolwork gets tackled and no homework gets lost?! If these weren’t inspirational enough, drop us a line and we can get that truly chic and perfectly kid friendly room started for you! We look forward to hearing from you. When designing or redesigning a space, organizing your ideas with a mood board can be super helpful. A mood board provides visuals for potential themes for a room. These can include photo collections of objects tied together by a unifying theme, mood, or color palate. Here at La Finca we love to use mood boards! 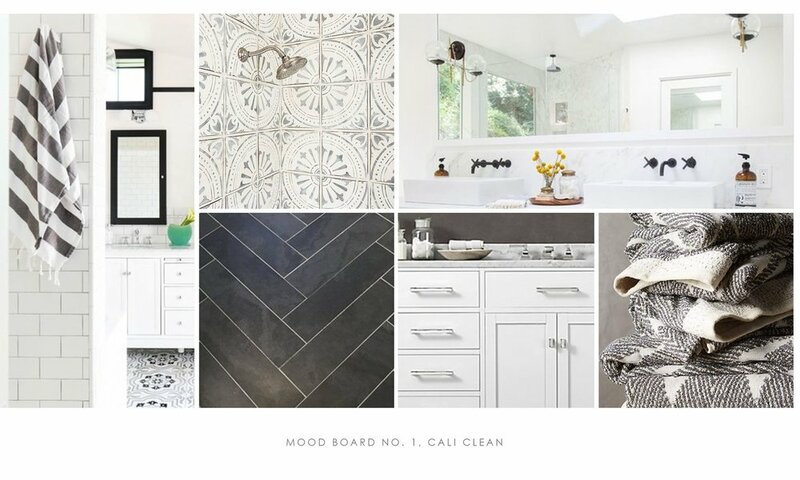 Mood boards make it easier for us and our clients to visualize a cohesive space. Mood boards capture the type of ambiance, mood, or feeling clients want their guests to have when entering a room. Mood boards frequently use certain colors associated with mood and decor items that reflect the same feeling. 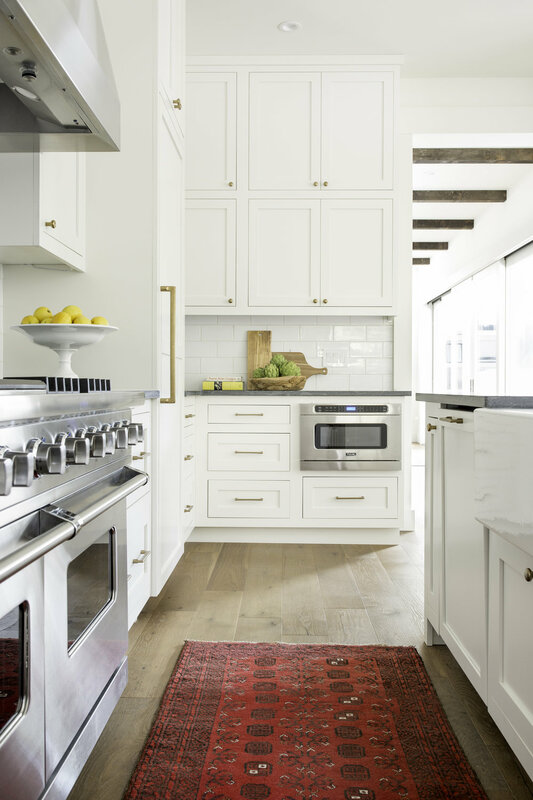 For example, a sunny kitchen might encompass photos of a golden-yellow paint shade, warm wooden tables, fresh white dishes, and other cheerful decorative items. There are several easy-to-use apps and websites that anyone can use at home on their phones or computers. Moodboard is a popular app for the iPhone and iPad (and, there's even Moodboard Lite, the free version). Moodboard gives users a way to import their photos from social media, crop them, and organize them in space like a digital corkboard. Index is a similar, simpler app that has a corkboard background and allows one to create post-its. This helps those who are more verbally than visually inclined. If you prefer familiar social apps or websites like Pinterest, it's extremely easy to make collages just by signing up and "pinning" your favorite design photos. Simply create a board, then surf your favorite design blogs and home decor websites. Add photos that match the idea of the board. 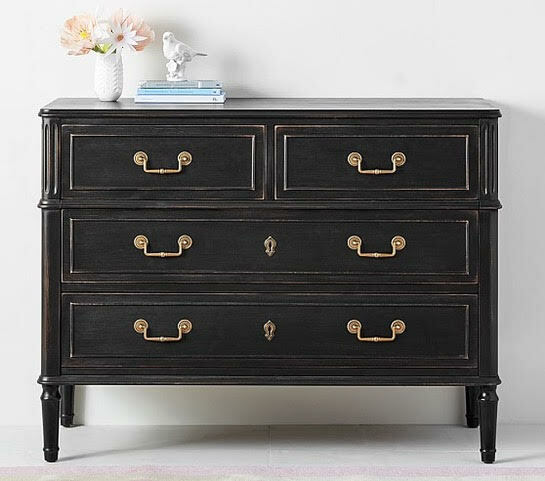 Search for chic paint swatches, furniture, and keywords pertaining to the theme. By opting to "pin" the photo to the board, the collections assemble these into one single place. You can create boards by design theme or style, by room, or however makes sense to you. Whether it's a website, sitting down with an interior designer, or using apps on your iPad, iPhone or smart phone, there are many ways to use mood boards. Mood boards can spark your creativity and keep your ideas organized at the same time. Finding unique art can really make or break a room. There are so many places to choose from and so many things that you have to think about when it comes to choosing art! You want something that is distinctive, one-of-a-kind and really captures the essence of the space you are decorating. 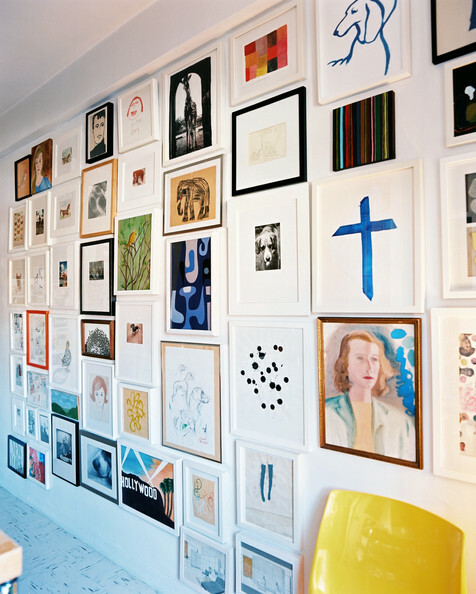 To make it easy, we have compiled some of our favorite places to find those pieces of art that will brighten up any wall! Minted offers a wide selection and unlimited options of affordable, diverse art prints! Not only are their prices fantastic, but they have unlimited ways to customize—meaning you can get exactly what you are looking for. And with prices so affordable ($21-200+) you can decorate any wall without breaking your bank! Unlimited selection+reasonable price points+ supporting independent artists= a very happy customer! Artfully walls is another place that we get our art and the reason is simple—they are so interactively helpful, there is no guesswork when it comes to ordering their art! They have an iPhone app that lets you visualize the art you are interested in on the walls you are looking to decorate. Easy peasy lemon squeezy! And they have something for everyone. From photos to abstract portraits to whimsical landscapes you can find that one piece you have been searching for to complete a space, or an entire grouping of art that makes a gallery out of any room. 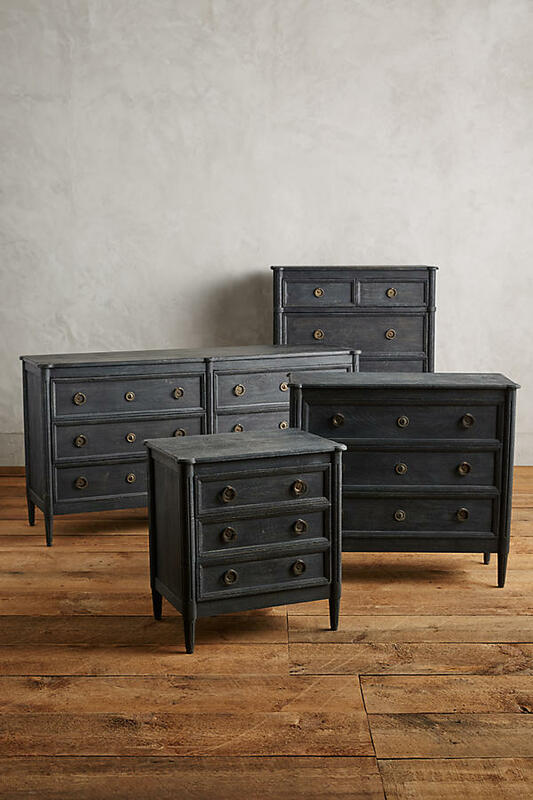 Price point ranges from $50-over $500—no complaints here! Lost Art Salon is another good stop for eclectic art. Focusing on the restoration and preservation of art from the 19th Century through the present, our inner modern art fanatic goes C-R-A-Z-Y here. The price here ranges from $35 to a little less kind on the wallet ($5,965), but everything is entirely worth it. Their art is professional and from renowned artists that are unparalleled in quality and sophistication. Need help styling those new art pieces on your wall? Contact us and we’d love to help create an eye-catching and eclectic wall art display! What’s an unexpected way to change the vibe of any room? The answer’s hanging right over your head. Don’t overlook your ceiling when considering your options. We think wallpaper’s a great way to raise your eyes and your design expectations. Do bear in mind the size of the room when picking your paper. 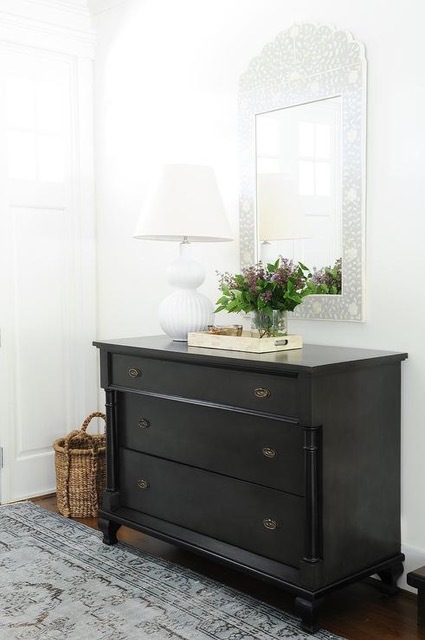 Darker colors can make small spaces feel even smaller. Metallics and light, subtle patterns, on the other hand, can provide a bit more breathing room. A larger room with lots of light gives you the chance to live la vida loca! We’re crazy about this print from Hygge & West. We love the green, but it comes in ten other colors. We think it’s perfect for a kid’s room! Imagine your little ones waking up to birds and flowers every morning. House of Jade Interiors made great use of this wallpaper in their modern farmhouse girls' room project- swoon! The right wallpaper can most definitely add drama to the adults’ bedroom. Check out this bold option from Cole & Son. Consider extending it from the ceiling down one wall. We think it’ll make you want to spend a little more time your room! If your tastes run to the more understated and subtle, we suggest this star-spangled print from Osborne & Little. It’s offered in three colors, including a yummy cool aqua. If you can’t commit to papering an entire ceiling, this is a great options for highlighting alcoves. Wallpaper is just one of the many creative tools we use to transform your space into your own personal Finca. Contact us for more information on turning your home into your dream home. Our client was looking to let a little light back into her life for the summer. Let us know how you think we did!